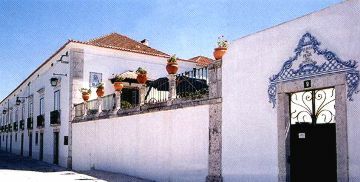 Quinta da Praia das Fontes is located in Alcochete, a small village located on the south bank of the River Tagus, near the Estuary Nature Reserve. The Quinta has wonderful views to Lisbon and, the famous Vasco da Gama bridge. Salt has long been one of the main industries here, and saltpans can still be seen to the north and south of the town. The town can trace its history back to the 7th century, after the Moors conquered Lisbon. Alcochete was an important royal retreat, with both João I and João II spending long periods here. It is also the birthplace of King Manuel who was born n 1469. 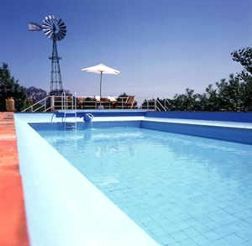 Quinta da Praia das Fontes has recently been carefully restored and furnished by the present owners. There are four rooms off the main patio, all with private entrance, plus another double bedroom in the house. 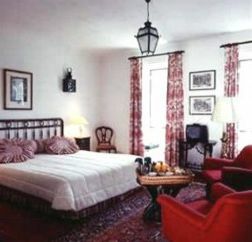 In addition, another four rooms have been converted into self catering apartments. 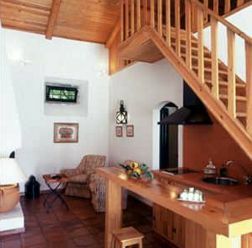 Built on two levels, they can accommodate a maximum of 4 persons, ideal for a family with children. Each apartment has a sitting room and a kitchenette equipped with a microwave, 2 ring electric cooker and a fridge. All the bedrooms and apartments feature a fireplace and have ensuite bathroom and television. Breakfast is served in the beautiful, old kitchen located in the main house. The former grain store has been converted into a games room with a Portuguese pool table, table tennis, games table and table football. The garden features a large swimming pool and there are changing rooms, a tennis court and a lawned area for playing games. Horses are stabled at the Quinta and riding lessons are available on request. Quinta da Praia das Fontes also has facilities for banquets and conferences located in a separate area to that reserved for residents. There is a small conference room in the grounds for up to 70 people. The Quinta's wine cellar has been superbly converted into a banqueting room for up to 100 people. This property is located approximately 10 kilometers from Vasco da Gama bridge and is approximately a 25 minute drive to Lisbon.